Establishment of Knanaya Region to the establishment of St. Mary's Parish. First Holy Communion and confirmation at St. John Brebeuf Church, Niles, for both Addison and Chicago Rel. Education Students. Followed by dinner at White Eagle Banquet Hall. First Holy Communion at OLV Church for students from Addison and OLV Religious Education Schools followed by dinner at White Eagle Banquet Hall. Fr. Abraham Mutholath revealed the location of the church to be bought during the Music Concert by Rev. Fr. Paul Poovathumkal at Thaft High School Auditorium. First Mass at St. James Church in Maywood for Knanaya Catholic Mission at 7:00 P.M.
Inauguration of Sacred Heart Knanaya Catholic Church in Maywood at 10:00 A.M. by Vicar General Rev. Fr. Abraham Mutholath and parish council members. Purchase of Church property in Maywood for Sacred Heart Church from the Archdiocese of Chicago. Blessing of new interior architectural work of Sacred Heart Knanaya Catholic Church and declaration of Knanaya Catholic Mission as Sacred Heart Knanaya Catholic Parish and appointment of Mission Director Rev. Fr. Abraham Mutholath as pastor or vicar of the parish by His Excellency Mar Jacob Angadiath. Combined Third Religious Education Festival of Sacred Heart and St. Mary’s Religious Education Schools at Thaft High School auditorium. Bishop Mar Jacob Angadiath was the chief guest. Annual Retreat by Fr. Michael Vettikkatt and Fr. Mathew Manakkatt for St. Mary’s Unit at KCS Community Center. Children and Teens Ministry program at OLV School by Jesus Youth Team of Chicago. First Holy Communion and Chrismation of 24 students of St. Mary’s Unit at St. John’s Church in Niles. Charismatic Retreat at KCS Community Center by Shalom TV Team under the leadership of Bro. Benny Punnathura. Holy Mass by Mar Mathew Moolakkatt for St. Mary’s Unit at O.L.V. Church at 5:30 P.M.
Agreement with KCS to have St. Mary’s Church and Community Center at the property of KCS property in Hoffman Estates. Retreat for St. Mary’s at KCS Community Center and OLV Church by Arvindakshamenon. Forth Religious Education Festival of Sacred Heart and St. Mary’s Religious Education Schools at Mather High School auditorium. Bishop Mar Jacob Angadiath was the chief guest. Annual Retreat by Annual Retreat at KCS Community Center by Devine Retreat Center, New Jersey, the U.S. Branch of Potta Devine Ministry. Fr. Anthony Thekkanath V.C., Fr. Martin Kalamparambil V.C. and Toby Manimaleth. Holy Mass by Bishop Mar Joseph Pandarasseril, Auxiliary Bishop of the Archeparchy of Kottayam at OLV Church for St. Mary’s Unit. Holy Mass by Mar George Palliparambil and homily by Mar Mathew Moolakkatt at 5:30 P.M. at OLV Church for St. Mary’s Unit. Fr. Abraham Mutholath handed over sponsorship amount to Bishop Mar George Palliparambil to construct a church in the Diocese of Miao in the name of St. Mary’s on behalf of St. Mary’s Knanaya Catholic Unit in Chicago. Seminar of Parish Development at OLV Church at 6:30 P.M. for St. Mary’s Unit. Decision made at OLV Church to buy 2.42 acres of land at Hoffman Estates close to property of KCS for St. Mary’s Church. Fundraising committee meeting at KCS Community Center for St. Mary’s Unit. Fund raising kick off for St. Mary's Church at OLV Church. Fundraising Kick of St. Mary’s Unit at St. Emily’s Church after Christmas Mass. Retreat for Couples and Youth at Bishop Lane Retreat Center, Rockford for Sacred Heart Church and St. Mary’s Unit. Holy Mass by Mar Mathew Moolakkatt at OLV Church. Former decision to purchase property at Hoffman Estates for St. Mary’s Church was dropped in the general body held today evening at OLV Church. Fifth Religious Education Festival at Glenbard East High School, Lombard, Inauguration by Bishop Mar Jacob Angadiath. Theme: “To God Through Saints”. Inauguration of Kerala Expo at OLV School by Fr. Abraham Mutholath at the request of the School Principal. Annual Retreat for St. Mary’s Unit by Kulathuvayal Team lead by Rev. Fr. Jose Narithookkil, Sr. Tessin and Sr. Margaret Mary at Community Center on 26th and at OLV Church on 29th. First Holy Communion of St. Mary’s Unit. General Body of St. Mary’s Unit held at OLV Church, decided to purchase a building in Arlington Heights for St. Mary’s Church. Submission of pledge forms at OLV Church to Mar George Palliparambil for the purchase of building at Arlington Heights for St. Mary’s Church. General Body at OLV church decided to buy the second Knanaya Catholic Church at Morton Grove. Family Renewal Retreat for children and youth above 12 and adults by Thy Kingdom Come Retreat Team at Maywood from 9:00 A.M. to 8:00 P.M. for both Sacred Heart and St. Mary’s Unit. Women Ministry of St. Mary’s unit met and designed various fundraising activities for the St. Mary’s Church building project. Fundraising and Christmas Celebration by St. Mary’s Women Ministry at OLV School for sanctuary remodeling of St. Mary’s Church. Closing of Morton Grove property for our second church at Morton Grove. Christmas Celebration with fundraising by Women’s Ministry of St. Mary’s Unit at KCS Community Center. St. Mary’s Unit bought a Jewish Synagogue at 7800 W. Lyons St., Morton Grove, IL 60053 for St. Mary’s Knanaya Catholic Church. The seller continued to use the facility until May 31, 2010. Thanks giving Mass at OLV followed by social gathering at KCS Community Center in celebration of buying the second Knanaya Catholic Church in Chicago. Piggy Bank Drive at OLV Church by St. Mary’s Religious Education School for St. Mary’s Church. Annual retreat for both Sacred Heart Parish and St. Mary’s Unit by Fr. Soichan Mullamangalam. Choir by Biju Malayattoor. Separate retreat for youth, teenagers, and children in Maywood Church from Friday lead by Mark Nemo Dr. Manoj Neriparambil, Dr. Sindu, Thomas Alumparambil, Josemon, and Rosina. Sacred Heart and St. Mary’s tour to Munster, Indiana at attend Jesus of Nazareth, a live passion play. Second Piggy Bank Drive at OLV Church by Religious Education School for St. Mary’s Church. Pilgrimage to Guadalupe to purchase religious items for St. Mary’s Church. Consecration of the Cathedral of the Diocese of Miao. The Madbaha of the Cathedral is sponsored by Sacred Heart Parish and St. Mary’s Unit. A huge statue of Jesus in front of the Cathedral was sponsored by vicar Fr. Abraham Mutholath who took part in the consecration of the Cathedral. Third Piggy Bank Drive at OLV Church by Religious Education School for St. Mary’s Church. Thanksgiving Holy Mass by Graduating students sponsored by KCS at OLV Church followed by reception at community center. Hall of St. Mary’s Church facility is available for use by the community. Inauguration of Morton Grove Knanaya Church Auditorium at 5:45 P.M. by former Chief Minister of Kerala State Mr. Oomman Chandy along with Ramesh Chennithala and M.M. Hassan. 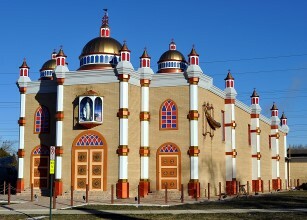 Special prayer service at Maywood and OLV to prepare spiritually for the six church consecrations in the Knanaya Region. Last Mass of St. Mary’s Unit at OLV. Last Mass and novena of St. Jude at KCS Community Center. Consecration of St. Mary’s Church in Morton Grove by Bishop Mar Jacob Angadiath. Mar Mathew Moolakkatt, Archbishop of Kottayam was the main celebrant of the First Mass offered in this Church immediately after the consecration. Mar Joseph Pandarasseril, the Auxiliary Bishop of Kottayam was concelebrant and gave homily during the Holy Mass. Fr. Abraham Mutholath was appointed today as its first pastor. The convent building at 7801 W. Maple St., in Morton Grove near St. Mary’s Church was blessed on the same day after the consecration of the St. Mary's Church in Morton Grove.